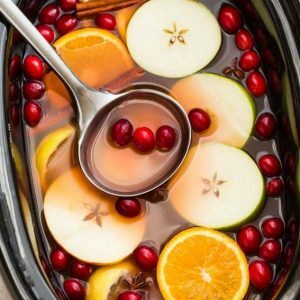 This Crock Pot Apple Cider Recipe is the perfect easy drink for fall and the holiday season. Best of all, made entirely in the slow cooker with apples, orange, lemon, cranberries, cinnamon and cloves. Set and forget and makes your house smell amazing! The holidays are quickly approaching and no holiday party is complete without a festive drink to sip on. 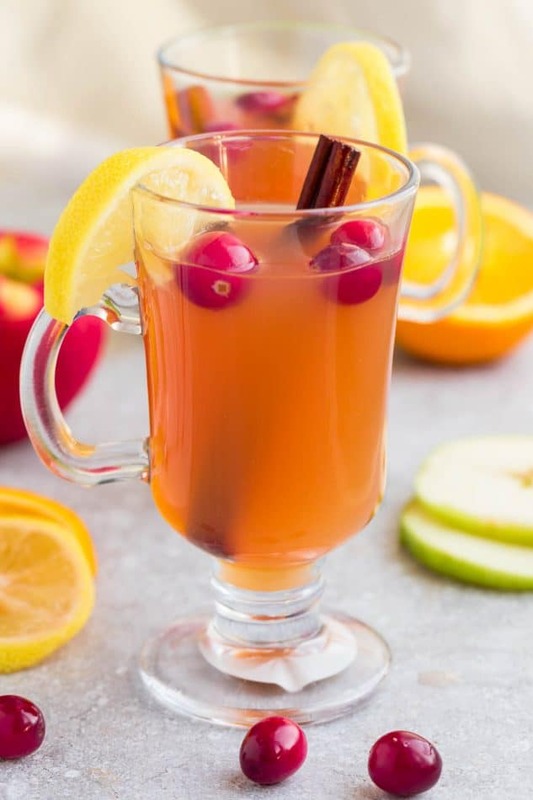 Homemade apple cider is a classic favorite and tastes amazing whether you serve it hot or iced. In fact, we’ve already made this cozy drink a dozen times. First an easy stovetop version, then a completely homemade from scratch using our Instant Pot and now, today’s homemade slow cooker version. It’s a simple set and forget recipe that you can easily customize according to what you have on hand. 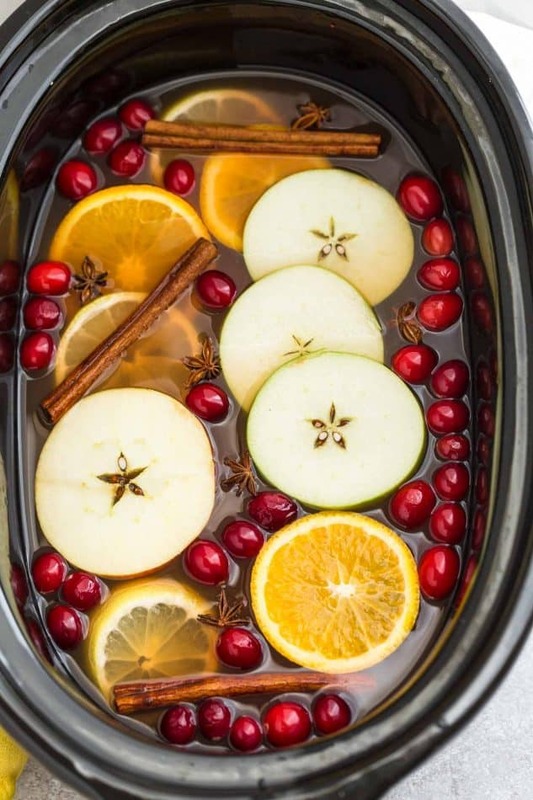 The combination of apples, orange, lemon and cranberries are infused with fresh cloves and cinnamon and cook down and make your house smell absolutely amazing. To start off, you’re going to place the chopped apples, orange, lemon and fresh cranberries into your slow cooker. Next, add some cinnamon sticks, cloves and star anise. Fill with enough water to cover the fruit. I use a large 6 quart slow cooker – you may have to adjust the amounts depending on the size of your slow cooker. You can add any sweetener of your choice and adjust the amount according to your taste. Coconut sugar, brown sugar, maple syrup, honey or any low calorie sweetener would work just as well. The combination of orange and lemon add that fresh citrus burst of citrus that pairs amazingly well with the cinnamon and cloves. 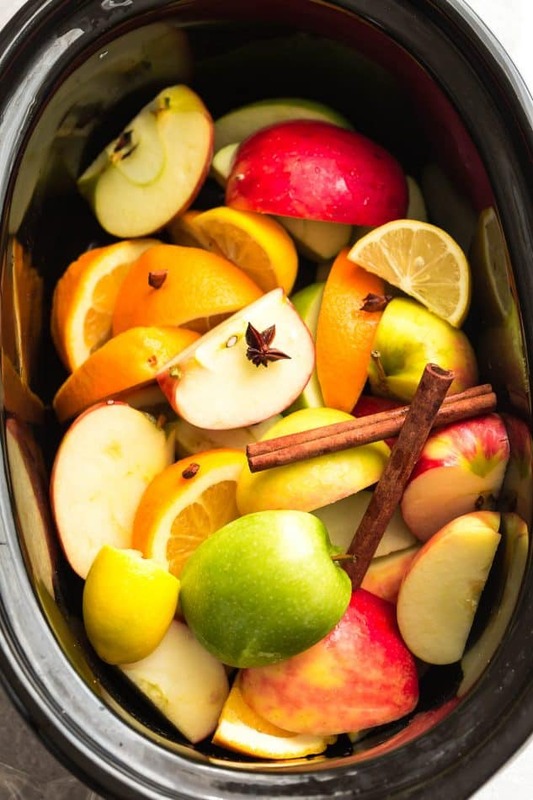 The best part about making your own crock pot apple cider is that you can alter it slightly for different occasions. You can leave out the cranberries or orange depending on your mood or what you have on hand. Either way you choose, grab a warm mug and cuddle up by the fireplace. Or add some caramel and whipped cream for a dessert drink. 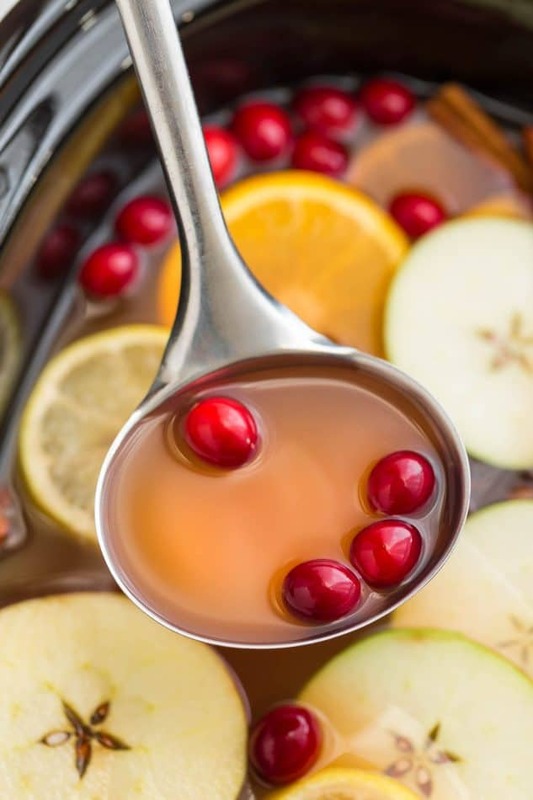 This apple cider recipe is so easy to make and tastes so delicious. Simply throw all the ingredients into a slow cooker for a warm and festive beverage. 1/4 - 1/2 cup sweetener of your choice sugar, brown sugar, coconut sugar, maple syrup, honey, Stevia etc. 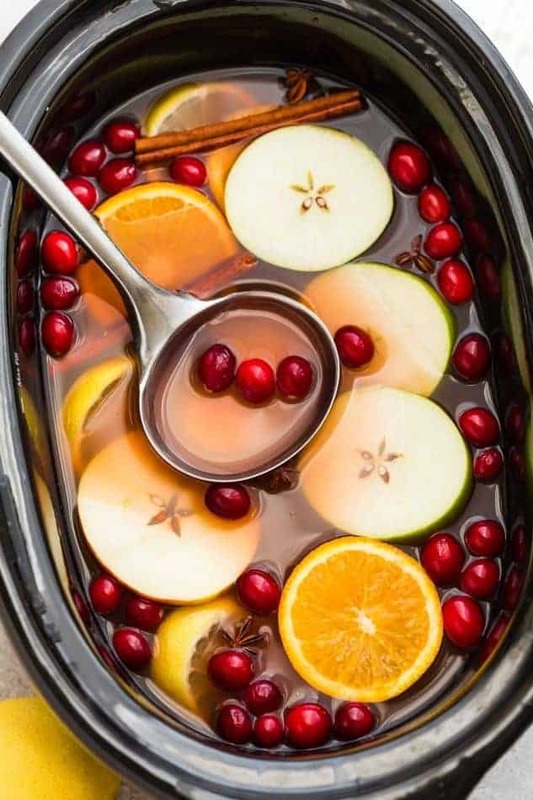 Place the quartered apples, orange, lemon and cranberries into a 6 Quart Slow Cooker. Add cinnamon sticks, whole cloves, star anise (if using) and pour water over top (enough to cover the fruit). Mash the fruit with a potato masher to release the juices. Cover and cook an additional 1 hour on low. Carefully strain the solids from the liquids using a fine mesh sieve. 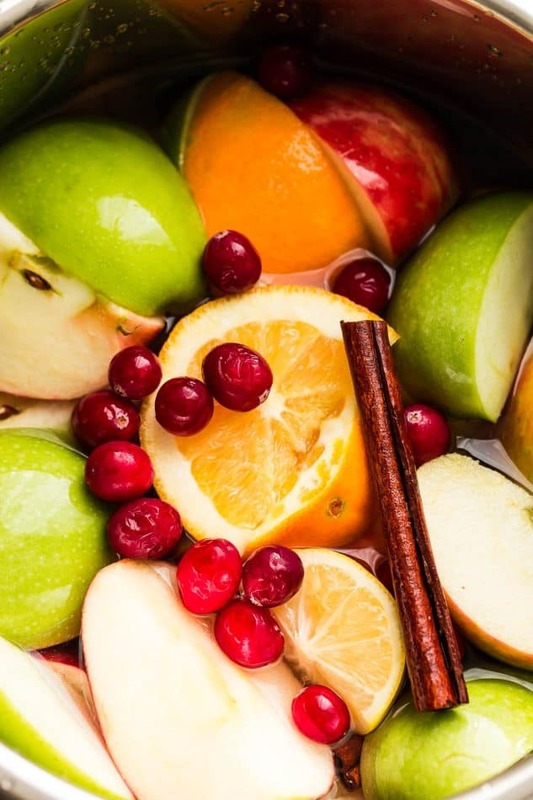 Discard solids and store cider in an airtight container for up to 1 week or freeze for later use. Love apple cider! This looks amazing, Kelly! Love apple cider! This one looks gorgeous! Thank you!